As we age, we may experience reduced visual acuity, reduced reflexes, changes in posture, loss of muscle mass, and arthritis, all of which may combine to increase risk of falls for the elderly. Age-related muscle loss is known as sarcopenia, and research has shown a strong link between loss of muscle mass and loss of strength. Loss of muscle mass is most pronounced in sedentary individuals, though it is also seen to some degree in those who have lived physically active lives. Inactivity is just one factor contributing to muscle loss. Other factors include changes in hormones, reduced protein synthesis, and loss of motor units. Exercise, strength training in particular, has been shown to reduce loss of muscle mass. Inactivity tends to increase loss of motor units, particularly fast twitch motor units. A motor neuron, along with the muscle fiber it is associated with, make up a motor unit. The nervous system controls the speed of the motor unit, which is determined by the amount of force the muscles need to produce in size order, from smallest to largest. There are three types of motor units. They are known as slow twitch oxidative, fast twitch oxidative, and fast twitch glycolytic. When a motor unit is triggered, all of the muscle cells in that unit contract at full intensity. When the muscle cells contract they do so at 100%. The difference between slow and fast twitch motor unions is that fast twitch units control more and larger muscle cells capable of producing greater force. Slow twitch units fire and contract more slowly, and control fewer and smaller muscle cells. As we age, motor neurons begin to die, resulting in a process known as de-enervation. During this process, muscle fibers begin to atrophy and die, leading to reduced muscle mass. This is seen more in fast twitch motor units, so the slow twitch motor units compensate for the loss, causing a sort of remodeling of the muscles. As the muscles remodel, the slow twitch motor units have less -controlled and less precise movements with less force. As we age, the number of functional motor units declines. Step speed, along with initial recovery compensatory step, have been shown to be significant factors in responding to disturbance challenges. Computer-controlled treadmill, with the use of a safety harness, can be used to identify performance of compensatory response. Risk of a fall after a trip response was shown to be reduced by as much as 83%. Researchers found that an increase in forward velocity and a forward shift of the center of balance requires increased minimal step length for balance recovery. Improving balance, strength, and gait are just some strategies that can help improve postural reactions to avoid disturbance. Research presented by researchers from the University of Illinois Chicago placed individuals in unstable conditions using a controlled, movable platform that imitated the effects of a slippery floor. Eight participants practiced on the platform a total of 37 times. The platform was set to release unannounced 24 of those times, causing the participant to slip forward or backward. The study found that none of the participants fell, and of the eight only one ever lost balance. 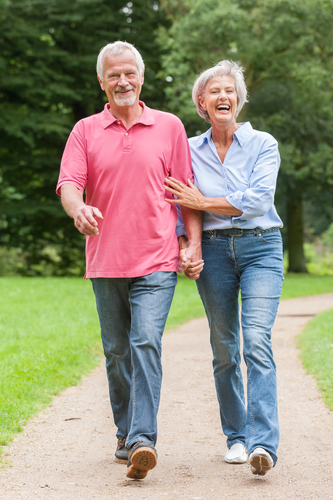 The study shows neuroadaptation to fall prevention strategies, and the ability to learn to maintain balance to avoid a fall. Induced stepping can be combined with improved skill retention. DePasquale developed a method known as RIPPS (repeated incremental predictable perturbation in standing). This is a first attempt, single failure protocol that quantifies forward and backward stepping limits. This method is both reactive and anticipates perturbation and a spring scale test. This concept focuses on motor unit recruitment, strength training, and improving step speed reaction along with maximal step length to improve ability to effectively respond to perturbation. It involves a learning process that trains acquired reflexes through repetition and improved movement speed without thought that can be applied to improve the ability to withstand perturbation, reducing fall risk. Equipment required: stopwatch, gait belt, colored targets, and nine cards. This maneuver calls for a floor pad on which there are colored spots each approximately 9 inches across, approximately 10 inches apart, and approximately 10 inches from the starting point. These targets, from left to right, are red, green, purple, and blue. Yellow targets are located just behind both feet. Directions: The subject begins by standing in the starting position. The index cards each instruct the subject to move one foot to a specific spot and return to the start as quickly as possible. For example, a caller will read the card and instruct the subject to move “left foot blue.” The subject will step forward with the left foot to the blue target and return. The next card might read “right foot red”, and the subject will step with the right foot to the red target in return. After the first direction is called, the stopwatch is started. After all nine cards have been called, the timer stops. The cards are shuffled in the process is repeated. In this maneuver, timed speed stepping is performed in response to unplanned patterns as directed by verbal instructions in various lines of movement. Movement speed is measured so that progress may be monitored. The challenge of this exercise is increased by crossing the midline and stepping backwards as instructions on some cards. The gait belt is used for the safety of the subject. Directions: The board is placed on an even surface with the subject standing comfortably in the middle of an perpendicular to the board. Red pegs are placed next to each foot to mark the starting point. The subject is then asked to step as far as possible to the right, and a green peg marks the subjects maximum step in that direction. The subject returns to the starting position and then is instructed to step to the left with the maximum step marked with another green peg. The subject then steps from the starting position to the maximum step target as quickly as possible, switching from side to side to facilitate weight shift and offloading. The subject is timed through four series of movements, a series being one step to each side. A yellow peg is used as a target peg to mark a maximum target of one third the total height of the subject. So if the subject is 6 foot tall, the target peg is placed 24 inches from the starting point of each foot. The same maneuver can be applied to forward stepping. This maneuver is used to measure maximum step length and speed with pegs as visual markers, both as targets and to measure progress. The holes in the board at 1 inch increments conveniently measure step placement. Improving step speed and stepping distance allows the subject to recover from perturbation with less risk of falls. Directions: A wide back support belt, such as those commonly used by weightlifters, with a band or O-ring attached, is placed on the subject. One end of a theraband is attached to a rail and the other has a spring-loaded clamp. The subject stands facing the rail about 3 feet away with feet together. The theraband is stretched from the rail to the O-ring on the belt. The therapy and is used to pull the subject in such a way that supervised perturbation results. The pull is just enough to trigger a reflexive step in the direction of the pull. Changing the color of the band, the tension, and the distance of stretch changes the force of the pull. Theraband has a chart to help you convert band to wait. This maneuver is a first step non-anticipated reaction that can be used in all planes. Progress is measured by the subject’s initial reactions with increased force. In this maneuver, the balance of the subject is challenged by a controlled and supervised force that allows the subject to step reflexively in the direction of the force. The idea behind this maneuver is to train the subject to react to various controlled directional forces. Directions: The subject where’s the belt with the one foot length of theraband attached to one side of the belt and the other end to a handrail. The subject stands parallel to the bar and steps away from the bar stretching the theraband to twice its length. The subject holds position and is instructed to step forward and backward, in conjunction with the lateral pull of the band. The subject and then steps left to right, crossing the midline. After this exercise, the band is removed and attached to the back of the belt and the subject again steps away the subject then steps laterally forward and back crossing the midline. The exercises are again repeated with the band attached to the front of the gait belt. This allows the subject to practice the movements in multiple dimensions. Different bands can be used to change the force. These exercises help to improve strength, balance, and postural awareness in order to maximize positive reactions to multidimensional changes in posture. Case studies have shown that Step Speed Enhancement improves overall step speed and length and subjects. It is reasonable to conclude that improving a subject’s ability to step faster over increased distances, patients can reduce the risk of falls. This protocol works to improve balance, coordination, and strength with visual and measurable goals with inexpensive equipment. Further studies are needed to determine long-term effectiveness of these exercises to reduce fall risk.